Trailhead is on Reservation Road, in Deerfield, NH (summits are in Nottingham). Reservation Road leaves Rt. 107 0.7 miles south of Rt. 43 and 3.1 miles north of Rt. 27. Parking is 1.8 miles down the road, on the right side. This long loop hike explores some of the highlights of the northern part of Pawtuckaway State Park, including North and South Pawtuckaway Mountains, Round Pond, and the boulder fields. The hike is a mostly easy, pleasant woodland meander, with occasional sections of steep climbing on the two mountains. The 6-mile trek starts near the remains of an old stone building. The trail follows a snowmobile trail into the woods, descending gradually. It soon crosses a brook, then intersects another snowmobile trail after half a mile. Turn right, then quickly left to leave the snowmobile trail. After 0.3 miles of somewhat steep climbing, the trail attains the long ridge atop of North Pawtuckaway Mountain. Watch for ledges on the right with limited views. For the next 0.7 miles, the trail wanders along the ridge top through a beautiful grassy and rocky forest. After crossing the viewless summit, marked with a cairn, the trail descends gently over more ledges, still on top of the ridge, 0.2 miles to a green communications reflector, reached by a side path on the right. The trail soon begins descending Pawtuckaway Mountain more steeply and enters a boulder-filled forest. It weaves through rocks on the steep slope and passes high walls, sometimes used for rock climbing. After 0.3 miles, the trail eases as it crosses a flat area on the ridge, then in 0.2 miles, drops off the ridge crest and descends 0.2 miles more to the marshy east end of Dead Pond. It then passes through the gap between Pawtuckaway Mountain and Rocky Ridge and descends into a boulder field. In 0.3 miles, reach the end of the trail turn left onto Boulder Trail. This trail follows the shore of an unnamed marsh which empties into Round Pond. Along the way, it climbs over and around more huge boulders at the base of another popular rock climbing spot. After passing Boulder Cutoff on the left, the trail ends in half a mile at Round Pond Road. Turn left, toward Round Pond, and go a short distance, then turn right onto South Ridge Trail. The trail closely follows the shore of the pond for a while, then pulls away and gradually ascends to a junction at 0.6 miles from Round Pond Road. Bear right to stay on the trail as Shaw Trail goes left. In 0.1 miles, pass South Ridge Connecter (an unsigned old road) on the right. The trail soon crosses a brook and passes a viewpoint over a small pond. It swings uphill and climbs steeply to the ridge top, then moderates as it leads across the long summit plateau, reaching the ledgy summit and fire tower in half a mile from the pond. 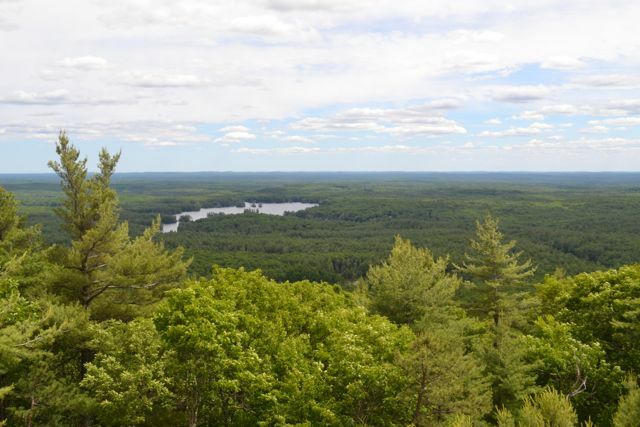 The tower provides panoramic views of southeastern New Hampshire. The terrain in most directions is very flat, except to the north, where many hills in the Lakes Region are seen beyond nearby North and Middle Pawtuckaway Mountains. As Tower Trail descends to the right (north), continue straight past the summit, staying on South Ridge Trail (an unnamed loop parallels this section to the left). Just past the summit are open ledges with ground-level views. The trail then descends moderately along the ridge on the opposite side of the mountain, passing through more boulders. It ends at Mountain Trail in 0.6 miles. Turn right, then quickly left onto an unnamed, unsigned path and proceed 0.1 miles to a dirt road. Turn left and go another 0.1 miles to Reservation Road. Turn right and walk one mile on the road, passing several marshes, back to the parking area.